So initially I was going to make this a review filled with some mild spoilers scattered throughout the post. Then I thought about it and I decided that there really is no point in doing so because when it comes down to it, there’s nothing really too much of worth to spoil in this movie. That being said, I may say some things that may be considered “spoilers” in this post; though if I do, please know that it wasn’t intentional. All I can say is after I watched this movie, I couldn’t help but think seriously, why did this movie even happen? Hahaha. On the one hand, I can give it some credit. There were some parts that were amusing, but then there were so many more sections of the movie where I felt like it just dragged on and on and on. And the ending was a little random. Hint: it kind of reminded me of the randomness of the ending to Slumdog Millionaire (2008). I think the younger crowd might enjoy this movie, like if they’re in middle school or something. I’m not sure about really young children, I could be wrong, but somehow I feel like they might not enjoy this as much. See this movie if you want, but I personally would just wait until it’s available for rent. 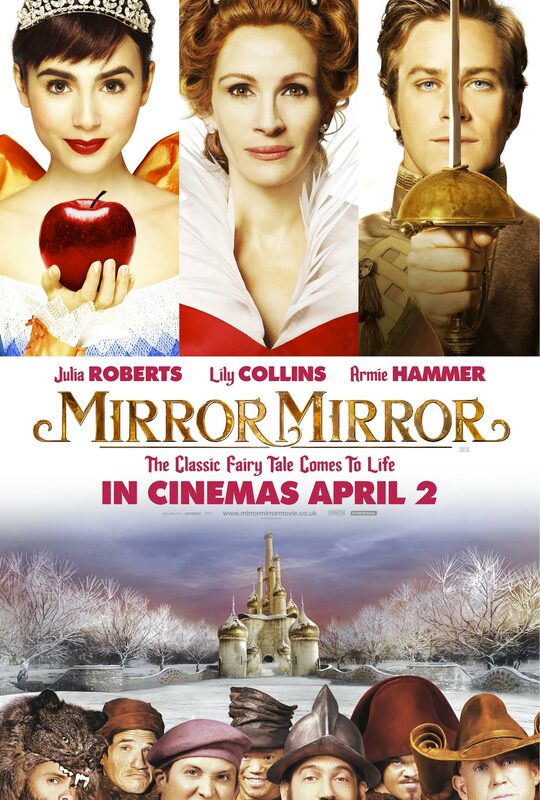 I find it interesting that there’s two Snow White movie adaptations releasing so close to each other. The other movie, Snow White and the Huntsmen, is releasing the first day of June. Kristen Stewart, Chris Hemsworth, and Charlize Theron are just a few of the people that will be starring in that movie. The two movies are also pretty different in tone—the one with Stewart as Snow White definitely looks less comedic and more “dramatic.” According to the trailer, it was made by the same people who did Alice in Wonderland (2012), and I can kind of see that—visually there are a lot of similarities in the editing. Also, a random quip, but there was a part of the Snow White and the Huntsmen trailer that kind of reminded me of Hayao Miyazaki’s Princess Mononoke (1997). The part where “Snow White” meets that stag in the middle of a forest. This isn’t the exact screencap from Princess Mononoke that I wanted to use, but I didn’t feel like going through the entire movie to find the one scene I was talking about. I just got this one off of Google. Well, that’s it from me for now. Until next time! I saw the trailer for this movie, and knew it had to be an awful one. Thanks for confirming my suspicion so I know to avoid this one. Haha yeah. You’re not missing anything by skipping this one. It’s not a great film. You’re right about that, but I was surprised how much better it turned out to be. Awful lines in the trailer like “Say hello to my little friend” and “Snow way!” made the movie look terrible. Imagine my surprise when none of those awful lines weren’t even in the movie. I’ll give Tarsem credit at least for making an incredible LOOKING movie at least. Nice review! Haha yeah, though sometimes the best parts of trailers get cut out. Like Vin Diesel’s “not today” line from the Fast Five trailer.